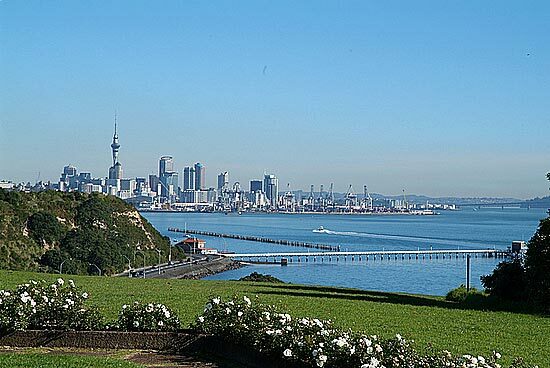 The view over Auckland from the Michael J Savage Memorial. 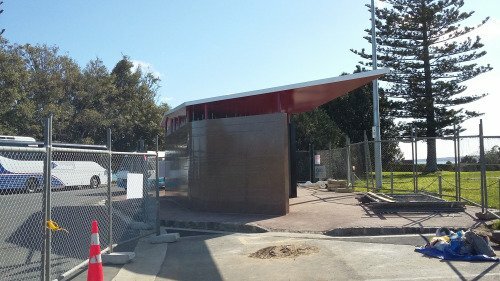 We were pretty honoured to be asked to provide the roof to the new ablutions block at the Michael Joseph Savage Memorial Park in Auckland. It’s one of the prettiest spots in a very pretty city, and the view across the city is breathtaking. It’s also one of the most contentious sites, having been the focal point of much of the Maori Land Rights protests in the 70’s. The upgrade of the facilities was therefore a very delicate matter, and our role was to create a stunning low profile roof that drew from the natural beauty of the site and blended in. It also had to be 100% watertight, as it was designed as a massive funnel to collect rainwater off the roof. No problem! We had just moved into a fantastic new facility in Highbrook, and we had the resources to fabricate the entire structure in house, allowing for much more precise engineering than would be possible welding this up on site. 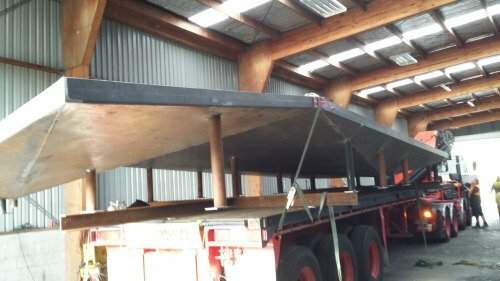 Like most of our precision jobs, the finished structure would simply be trucked to the site where it would be winched into place and fixed in place. The job was completed well ahead of the scheduled delivery date, and we were feeling pretty happy with everything… until the truck arrived, and we realized we were not going to be able to get the loaded truck through the doorway. The roof fitted, but the truck couldn’t negotiate the forecourt with it on. A split second of panic ensued as we visualized cutting holes in the walls of our brand new facility. But pretty quickly we realized that access through the (rarely used) back door was less restricted, and with a little bit of creative maneuvering we had the job loaded and dispatched. The toilet roof is delivered and installed without incident. The roof is now proudly installed atop the ablutions block overlooking Auckland City and the Harbour. R&H Engineering are general engineers with substantial capacity and the ability to design and produce bespoke engineering solutions for industry and construction. With our extensive manufacturing experience in agriculture, architecture, construction, stainless steel and even outdoor furniture, we are confident that we can deliver superior engineering projects, of any size, on time and on budget.